Find an Oklahoma fall festival to attend in 2019. Our events calendar for September, October and November 2019 has things to do across Alabama including activities in Oklahoma City and Tulsa. Our list includes festivals celebrating the local harvest, food, music, beer, Oktoberfest and more. A Victorian-themed Christmas festival held annually on the weekend before Thanksgiving. Wagon rides, costume contest, living nativity, “Tales from the Top” tour, shopping and food. Admission is free. Annual arts and crafts festival held at the Fin & Feather Resort near Lake Tenkiller. Browse through over 170 arts and crafts vendors. Hosted by St. George Greek Orthodox Church. Annual celebration of the birth of McAlester (the historic town) and the Wild West. JJ McAlester’s original home and his mercantile buildings will be available for tour during the festival. Wine tasting, parade, Great Rat Race (10K, 5K and fun run), Race the Rail (bicyclists), cheese food contest and cheese demonstrations. 2 day pass for ages 13+ is $5. Head to the Nut House for a car show, pecan pie-eating contest, craft show and kids games. Carnival rides, family fun zone, wine & beer garden, barnyard birthing center, frontier experience and more. Established in 1914. Carnival, chainsaw carvings, fair food, livestock and agricultural exhibits. Admission is free. Celtic music festival and Scottish Highland Games, plus dancing, whisky tastings, and more. 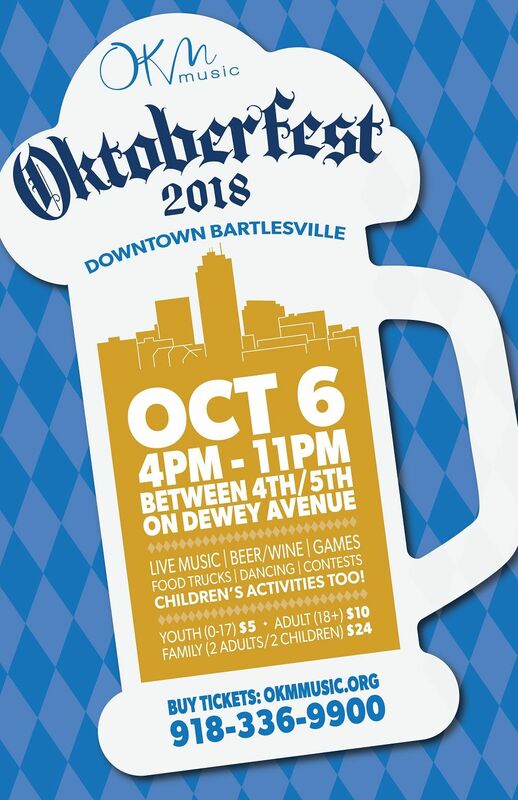 An annual event on the third Saturday of September, celebrating life in Oklahoma with a parade, kids area, car show, live music, food trucks, and a Made in Oklahoma vendors area. Pioneer Day Festival starts with â€œChalk the Walkâ€ and the Color Run. Pioneer Day Parade starts at 9:00 am. Midway with food vendors, amusement rides, carnival games, talent competition, Petting Zoo, kid’s fishing derby, chalk art contest, and more. Live music on entertainment stage. â€œFantasy On Wheelsâ€ car show in the parking lot the West Rogers Campus of First Baptist Church. Tulsa’s oldest ethnic festival at Holy Trinity Greek Orthodox Church, with Greek food, KidZone, dancing and more! Tiger Safari is pleased to announce our first annual “Wizarding World of Tiger Safari!” Come in and join us September 25th through October 31st. There will be photo opportunities for wizards and witches of all ages to dress up in their Hogwarts robes and get their picture taken with our Eurasian Eagle-Owl. Pictures will be taken in front of a green screen so you’ll be able to hold Luna or Hedwig while standing in front of Hogwarts itself!! Guests are more than welcome to show their house pride and bring their own wizards robes for pictures, but fear not if your house-elf has misplaced yours for we are more than happy to provide Gryffindor robes for witches and wizards big or small. Tiger safari was opened in 2003, on 45 acres just south of highway 37 in Tuttle, OK! Presently they have over 170 animals. They have a new education center, reptile facility, tiger overlook deck and welcome center. Open Tuesday through Sunday, 9 AM to 5:30 PM. Disney on Ice, Livestock shows, vendors, food, carnival rides, live music, and more. Since 1903. Parade of nations, music concerts and children’s area. Held at Elmer Thomas Park. No admission or parking fee. Since 1979. Three days of rowing, kayaking, dragon boats, whitewater rafting, and family fun. A highlight of Oklahoma’s artists, live musicians, and more, with children’s activities as well. 70s and 80s Throwback Weekend, arts and craft vendors, and more at Wolf Creek Park. Come on down to Arbuckle Mt Park for the fall bluegrass jam, with bluegrass music, gospel, old country, and some family-friendly fun! $3 walk-in fee, free admission if you’re camping. Held on the LeFlore County Fair Grounds. Carnival rides, tethered balloon rides, helicopter rides and monster truck rides. Pageant, pet contest, mud race and mud tug of war. Free parking. Enjoy a marathon, half marathon, 5k, fun run, and more, starting in downtown Tulsa (home of the largest amount of Art Deco architecture outside of Miami) and running through the diverse neighborhoods of Tulsa and the campus of Tulsa University. Many of the neighborhoods host block parties all along the course to welcome runners! Labor Day Carnival & Parade – Henryetta, OK – September 2015. A four day celebration featuring a car show, parade, BBQ dinner, games, live entertainment, beauty contest, gospel concert, and ending with fireworks. Activities throughout main street and at Cameron Field. 49th annual event. Food, parade, dances and kolaches to celebrate Czechoslovakian culture annually on the first Saturday in October. 10 AM to 9 PM at the OKC Myriad Gardens. Live music, crafts and food to benefit Goodwill’s youth programs. General admission is free.